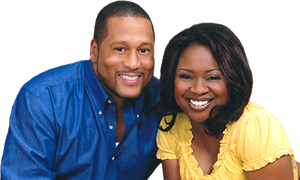 Pat and Gina Neely, the beloved husband-and-wife team and authors of the New York Times best seller Down Home with the Neelys, are all about lettin’ the good times roll. It takes family, friends, and ample good food, and in their new book, they share their recipes and secrets for entertaining year-round, dishing up new spins on seasonal classics, and suggesting occasions to celebrate that most of us haven’t thought of ourselves. Along with menus for Christmas, Thanksgiving, Easter Sunday, and every known holiday in between, here are all the fixings for a year of down home celebrating, 120 recipes including Hoppin’ John Soup and Deep-fried Cornish Game Hens for New Year’s Day; Smothered Pork Chops and Creamy Garlic Mashed Potatoes for “Welcome Home, Baby”; One-handed Turkey Burgers and Mint Tea for “Spring Cleaning.” The Neelys believe that life should be celebrated, holiday or not. With this mouth-watering collection of recipes you have everything you need to Neely-tize your table far beyond the holiday season.